Being prepared for an emergency is a smart thing. Having minimum two weeks (preferably 3-4 weeks) of stored food and water (don’t forget about toilet paper and other essentials) is important. Weather patterns are changing for many reasons (worldwide) and those who are not prepared may be in a heap of trouble one day. An example of this happened in West Virginia in late June 2012. Storms ripped through this area leaving thousands without power. Many of those who were affected had to turn to (an already over-burdened) food bank; this resulted in a minor food crisis. Never take life for granted. Boy Scouts and Girl Guides are taught to be prepared and there is a reason for this. What we have one day can be gone the next and even if you live in an area that is relatively “safe” from weather disasters, anything can happen. Not only is having supplies on hand crucial, having survival seeds is also very important. Chances are you may not need them, but global weather patterns are changing and our planet is experiencing post glacial rebound. One only has to see what agricultural disasters have happened this year due to weather to know that growing your food may be a wise decision. According to the 2030 Report, there is going to be many years of turbulence ahead of us. Storing survival seeds is easy, takes up little space and they truly are insurance no company can provide you with. The best way to store seeds is to package them in paper envelopes or bags since they allow for good air circulation and don’t sweat. Keep in mind that humidity and lack of air circulation will cause mold, disease and prompt seeds to germinate prematurely. There are no shortages of websites out there selling survival seeds and the vast majority of them are selling vegetable and herb seeds. Many are heirloom or non-GMO and some are just basic seeds. The marketing on these are quite amazing as many companies offer packages. Some of these packages are “plant a full acre,” “non-hybrid gift variety,” “wholesale bulk,” “doomsday preppers,” and the list goes on. Let’s look at this logically. On one hand having seeds to grow a garden is smart however, trying to grow a vegetable garden will be very challenging if there is little or no rain. Relying on tap water may also not be possible if restrictions are implemented. All is not doom and gloom here. Yes, purchase and save vegetable seeds, but more importantly save seeds from edible wild plants. Weeds grow in the most inhospitable of conditions therefore making them more reliable than cultivated food. Growing weeds in your backyard is as simple as tossing the seeds onto the ground. It is truly incredible how long (wild edible) seeds last. In fact, many wild edible seeds last up to 40 years (in the soil) before they germinate. Mullein seeds can survive up to 100 years, and each plant produces 22,300 seeds. Curly dock (yellow dock) seeds last up to 80 years and each plant produces 29,500 seeds. 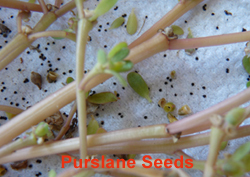 Purslane, pigweed and lamb’s quarters ‘seeds last up to 40 years, meanwhile chickweed and mustards can last up to 10 years. The dandelion seed can last up to 6 years and each dandelion plant produces up to 15,000 seeds. All of these plants are edible and between the dandelion, alfalfa, lamb’s quarters, purslane and pigweed you get every mineral, vitamin, protein, Omega’s and other essential nutrients your body needs to survive and survive healthy! Seeds are perfect for collecting right now in many areas of the northern hemisphere. It doesn’t take long to go out and collect seeds and the best part of all you get fresh air and exercise. Start saving seeds today – because we don’t know what tomorrow may bring. The Seeds of Survival program was founded in 1945. It promotes vibrant family farms, strong rural communities, and healthy ecosystems around the world. For information of this program, please visit the Unitarian Service Committee of Canada. Awesome article Karen. I have been trying to be more proactive in preparing my family and I for survival situations. One thing I totally overlooked was storing seeds. Many of us think of short term survival, but neglect to prepare for the worst of the worst. Using them for barter in times of economic collapse would be a great reason to store as many seeds as possible. Thanks Preston. Better to have and not need than need and not have! I don’t know who coined that phrase but it sure is true. As a species we tend to think short term – this gets too many people into too much trouble every day. We must think long term. Again, thank-you Preston! this is by far the best article on what seeds to store the writer sure is amazing and knowledgable. well done!!!! wow – Who would have thought about this? You are obviously one smart woman. I agree that the need to save wild plant seeds (native seeds too) is just as vital as saving fruit and vegetable seeds. I would love to read your paper on the topic! Please send me an email address and I will send you a copy. Hi. Great post. Thank you. Can anyone help me as I am looking to buy all the seeds you mention and more to start growing in my new garden. Where can I buy natural, wild non gmo seeds, I am all liking for anything that is an edible alkaline plant . I do not want hybrid plants as I am looking to create a totally natural wild growing garden which is all edible . This will help me learn to produce my own seeds and learn to store them. Try Richters – – they are in Ontario.